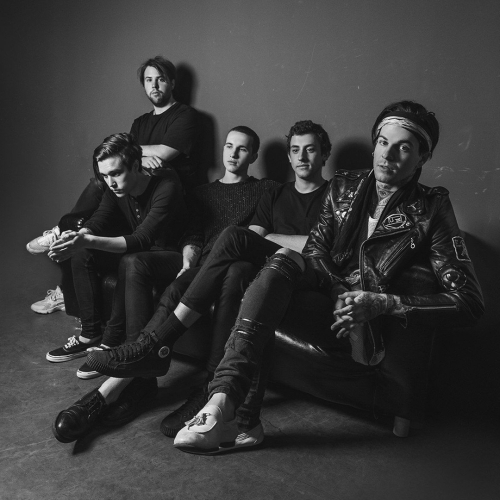 The Neighbourhood are an American alternative rock/dark pop band that formed in Newbury Park, California in August 2011. The band consists of Jesse Rutherford, Jeremy Freedman, Zach Abels, Mikey Margott and Brandon Fried. Bryan Sammis (drums) left the group in January, 2014. The band released their first EP, I'm Sorry... in January 2013, where their single Sweater Weather reached #1 on the U.S. Alternative Tracks and #8 on the U.S. Rock Tracks and #33 on the Billboard Hot 100. The song also charted at #68 in Canada. Their first album, I Love You. was released on April 23, 2013. In early 2012 a mysterious band appeared online. The group, The Neighbourhood, revealed no biographical information, no photos and no backstory, offering only a moody track titled "Female Robbery." Fans and the press were confounded, scouring the Internet for any information that might lead them to the identity of these musicians. Pieces of the puzzle, some reflecting reality and some not so much, began to emerge. The Neighbourhood were a quintet. They were from California despite the British spelling of their name. They had a second track, "Sweater Weather," which had an accompanying -- and equally dark -- video. Although The Neighbourhood's identity remained hazy, it became clear that the music they were making felt transformative to critics and fans alike. The evocative combination of rock instruments with R&B and hip-hop aesthetics seemed, in many ways, revelatory, a reimagining of sounds that seemed to make people clamor for more information with even greater fervor. In April, BBC Radio One DJ Zane Lowe, an early champion of the group, let it slip that The Neighbourhood was the handiwork of musician Jesse Rutherford, a resident of Newbury Park, CA. By early May, as the band unveiled a free, self-released EP titled "I'm Sorry," it became understood that the identity of this young band was, ultimately, secondary to the music itself. So who are The Neighbourhood? In essence, the group, which formed in August of 2011, is a collection of five friends who make music together. They're headed by Rutherford, a 21-year-old singer who has dabbled in various genres, including hip-hop, before crafting the merge of sounds that categorizes The Neighbourhood's style. Their debut EP produced by Justyn Pilbrow, who brought Emile Haynie onboard to collaborate on "Female Robbery." The EP, recorded at the end of last year, is composed of shadowy, emotional music with visuals to match. And it's all part of the band's master plan. "I always have a strong vision before I go into anything," Rutherford says. "I don't know how to make music any other way. It was all in my head, and that vision for the music was to make hip-hop beats with guitars and I was going to sing and rap over them. We wanted to do that hip-hop aesthetic on an indie platform." "I'm Sorry," a five-song disc, is a precursor to the band's debut album, which is also being produced by Pilbrow and Haynie. The album, expected out March 2013, will expand the group's moody sensibility, which pairs brooding layers of instrumentals with Rutherford's hip-hop-inspired croon. The style, which the band has dubbed "black and white" due to its confident inspirations, is based largely in rhythm, as evidenced by the EP. "When I started in music I started doing drums and then I started doing vocals," Rutherford explains. "And then I combined the two together because to me rapping is just rhythmic vocals. I think the rhythm of hip-hop is really what got me into it. It's not just words being said; it's about how the words are said." In the end, all you need to know about The Neighbourhood is in that music and in those words. There are more facts, more pieces of the puzzle, more information to unveil. But what's the fun in being given the full picture when you can slowly discover it for yourself? It's better to leave some mystery lingering. Because, after all, it's that unknowing that brought The Neighbourhood to people's attention to begin with.